Toledo Bartending School’s classroom coincidentally is your future place of employment – an operating bar. 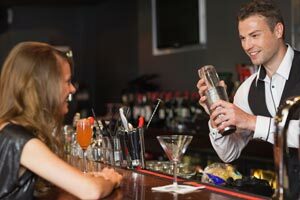 For the first chunk, you sit in front of the bar where you’re already comfortable, watching the instructors make each drink. 25% of the class is spent absorbing lectures, 75% is spent in action behind the bar. You will make every single drink. Simulated happy hours and role-playing get you ready for any situation. We know you have a million things you’re trying to do right now – class, jobs, family commitments…we get that your schedule isn’t a white wall open to one more inflexible obligation. New classes start each week. Click on each tab for more information! The accelerated class option allows the student to take our standard 40-hour course in one week. The student takes two, 4-hour classes each day for 5 days. The accelerated class is held Monday through Friday from 10:00am to 2:00pm and 6:00pm to 10:00pm The accelerated class is one week in length. The student may leave the school and return or stay in the classroom and study/practice. Every Saturday from 10:00am to 6:00pm, Five weeks in length. Monday through Friday from 10:00am to 2:00pm, Two weeks in length.